It always cracked me up that that these were a thing, but after a wine tasting event where many items were juggled in my hands, I can completely see the need for a DIY wine glass holder necklace. Hands free means it’s easier to take advantage of the appetizer table or shopping! 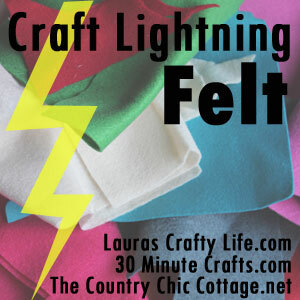 And since this is a Craft Lightning project, it’s going to take you less than 15 minutes to finish…and that’s on the high side. There are a few affiliate links below; they cost you nothing, but help keep this content free. Disclosure: I have not tested the long-term durability of these necklaces out of felt. I know walking around the house with it slung around my neck it was great. It’s less than a dollar’s worth of materials when you use felt, so I’m ok if the holder might be a one-time use thing. But if I had to guess, I’d say if you used some of Cricut’s lovely leather product you’d get some really long-term use out of this project! STEP 1: Wine Glass holder Cut and prep! I’m giving the instructions for the use as a Cricut Project–I included a PDF template if you need to produce this with a pair of scissors but the method really isn’t different beyond the cutting part. You can cut stiff felt with the deep cut blade setting on your Cricut machine or with the rotary blade on your Cricut Maker. Sadly, I can’t attach everything together to get the SVG file to make the fabric marks for you as well, but if I could that would be awesome!! So we have to go about it another way. After you import your SVG to Design Space, make a duplicate of the shape so two will be cut out. Follow the rest of the prompts to cut out the shapes onto your stiff felt. Marking the lines is optional, but if you’re not comfortable with winging it when your whip stitching your pieces together, it is best to pull out a ruler and mark off where you want your stitching to go. Honestly, I bought a pair of grommet pliers about two months ago and never thought I would use them as much as I have. They’re handy for putting in snaps as well as grommets, so worth the purchase. And as long as we’re being honest, EVERY SINGLE TIME I use these dang things I forget how. Yes, that means I ruin something or other before I figure out the right way to put the grommet in. So word to the wise, read your particular instrument’s instructions before use. Maybe every time. Obviously, I’m not the one to tutorial on how to do this at this point! Maybe in a month or two. In real life, I’m not an awesome seamstress. I jimmy rig most things associated with sewing, so I’m not going to get into a complicated sewing thing for these wine holders. Use some embroidery floss to whipstitch together your pieces as shown in this picture. I didn’t try it myself, but I bet hot glue would also work to assemble the pieces. When you’re done stitching the holder, turn it inside out. It’ll make kind of a V shape. It’s your option to fancy this thing up in all sorts of ways; you can finish the seams with a little more embroidery work or the edges with some fancy stitching (I like what Albion Gould did with these scissor holders!). Since needlework isn’t really my thing (but I’m insane with a glue gun!! ), I’m going to leave all that to your crazy imaginations. But do show me if you do something wild! I used 46 inches of ribbon for the wine glass holder necklaces in the photos–but adjust that for your individual persons. One end goes through each hole and you’ll tie it off. Cut the end of the ribbon at an angle or with a V for a nice finish. Step 6: Grab Your wine glass! Now that you have a proper wine glass holder necklace, it’s time to put it to good use! There’s a whole round up of Craft Lighting projects ready to browse through the link below. Lots of talented ladies out there making amazing stuff. Be sure to visit. This is a great idea for a party! This is such a cute idea, and would be great for a party!